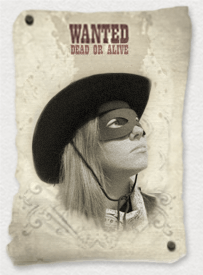 Wanted for a stage coach robbery in Tombstone and horse rustling throughout Arizona. Reputed to be the most skilled sharpshooter in the Midwest. Armed and dangerous – approach with caution. 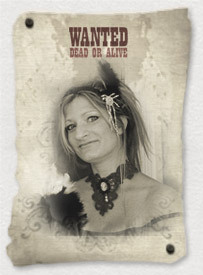 For running the infamous ‘Red River’ Brothel, bootlegging and a Railroad depot robbery in Oklahoma. May try to seduce you – approach with caution. 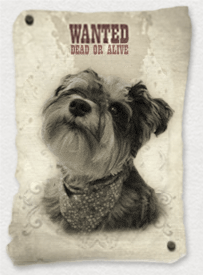 The infamous bandit, pistol-trained by the “bloodthirsty” Doolin Gang. 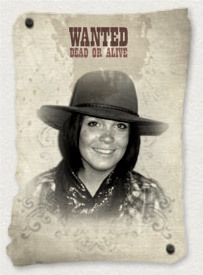 Wanted for her cattle rustlin’ antics and whiskey bootleggin’. Is known for consistently outwitting the law and stealing their ammunition. 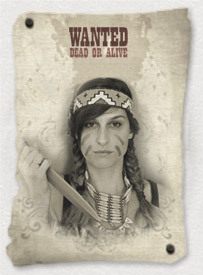 Wanted for the kidnap of a Cree Tribe member. This bloodthirsty warrior last seen disguised in buffalo fur amongst the rocky mountains of Southern Alberta. Lone survivor of the notorious Prairie Pals shoot out at Dead Man’s summit. Luck or treason? 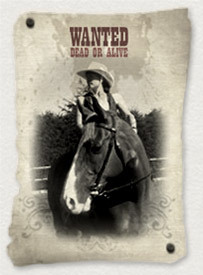 Last seen blazing a trail to the Badlands on her stallion ‘The Widow Maker.’ Shoot to kill. Native to Patagonia, 267 years old and known as the water gatherer. 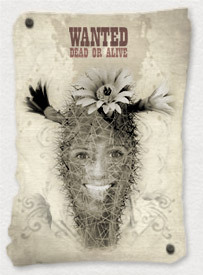 Leah is a prickly little character with poisonous thorns. Pretty to look at but don’t get too close!